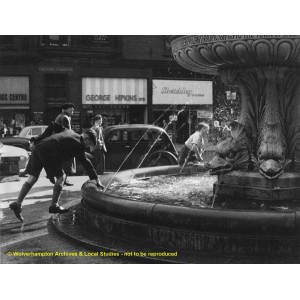 Description: An image entitled 'Fun At The Fountain' depicting boys playing in the Horsman Fountain in St. Peter's Gardens. Lichfield Street can be seen in the background. 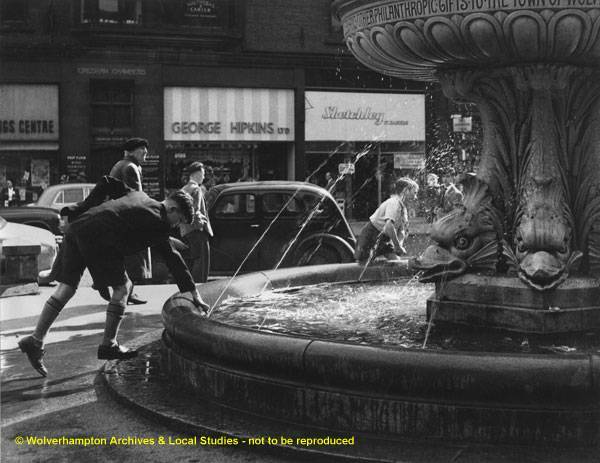 This image is part of Wolverhampton Photographic Society's Jim Dowdall collection. It was also exhibited at their 1960 Members' Exhibition at Wolverhampton Art Gallery. Admin History: The area of St. Peter's Gardens (surrounding St. Peter's Collegiate Church) was once part of St. Peter's churchyard. The churchyard was then given to the town and the graves were cleared to create the gardens. They have undergone many changes, with the most recent being in 2004, when a set of interpretation panels were installed, describing various aspects of the area. The area cleared revealed evidence of a medieval merchants' hall that once stood on this site. The gardens also contain a Saxon cross - the oldest standing artefact in Wolverhampton (also on the Coat of Arms), the Horsman Fountain erected in 1894 in memory of Philip Horsman who gave the adjacent Art Gallery to the town, and the Harris Memorial - a 1917-1919 bust by Robert Jackson Emerson (1878-1944), erected in memory of Seaman Harris who was killed in the Adriatic Sea while remaining at his post in the wireless room.